Heat oven to 375°F. In small saucepan, cook all basting sauce ingredients over low heat 3 to 4 minutes or until marmalade is melted, stirring occasionally. In 15x10x1-inch pan, place chicken breasts. Brush with half of basting sauce. In medium bowl, toss potatoes and onion with oil; place around chicken. Bake 25 minutes. Meanwhile, in small bowl, soak cranberries in 1/4 cup orange juice. Brush chicken again with remaining basting sauce. Stir gently to coat vegetables with pan juices. With slotted spoon, sprinkle cranberries over vegetables; drizzle with juice. 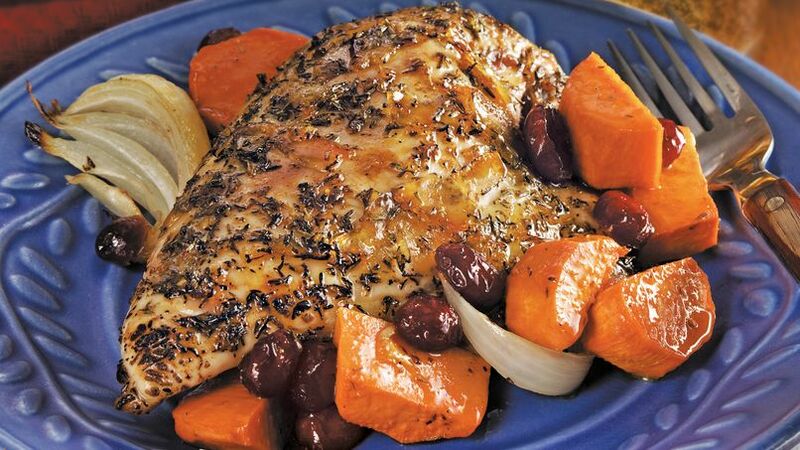 Bake 20 minutes longer or until juice of chicken is clear when thickest part is cut to bone (170°F), and vegetables are tender. Sweet potatoes are an excellent source of vitamin A and a good source of Vitamin C.